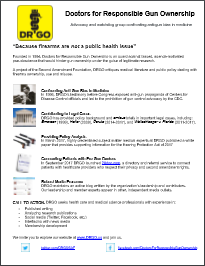 Recent public shootings – one in Toronto in July and another in New Brunswick in August –guarantees that gun control will become a key political issue in next year’s federal election. The issue of gun control is expected to be debated at a federal cabinet retreat this week in Nanaimo, B.C. According to federal officials, a number of options are currently being studied and could be announced in the fall. If you’re worried about gun crime in your area and you’re thinking of moving, sell your real estate with homeads.ca. The ruling Liberal Party sees gun control as a possible “wedge” issue. Public Safety Minister Ralph Goodale’s good sense will probably stop the federal Liberals from endorsing any of the more radical suggestions emanating out of Toronto, such as banning more handguns, but Bill C-71 is made to order. Officially known as An Act to Amend Certain Acts and Regulations in Relation to Firearms, Bill C-71 assumes that constricting the lawful sale and use of firearms will reduce criminal violence. 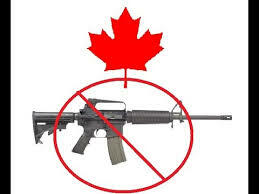 The draft legislation proposes new provisions which augment Canada’s already strict gun control regime. To possess a firearm, Canadians must qualify for a firearm license (and keep it current under threat of prison time). Carrying anything that could be used for protection risks police charges for carrying a weapon. Even a rolled-up magazine counts, if the purpose is self-defence. 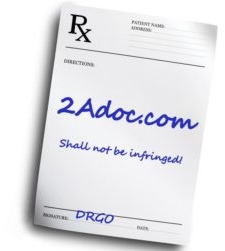 Handguns are registered, and ownership is limited to target shooters and collectors. Firearms already must be transported unloaded, trigger locked, and in a locked container. Permits to carry concealed handguns for protection are exceptionally rare. To even purchase a website there has to be a background check to help find people search free to see if they are able to own a gun. Bill C-71 would tighten firearms legislation in several ways, including: extending background checks to cover a buyer’s life history (instead of just the past five years), reinstating the requirement to request permits to transport restricted firearms to gun shops or gun shows, and unleashing the Royal Canadian Mounted Police [Ed: Canada’s federal police] to restrict or prohibit firearms. Under the new legislation, Canadians would again be required to undergo nightly police checks as law enforcement determines. Firearm vendors would also have to retain sales information for 20 years, a move decried by some as a “backdoor gun registry”. According to Minister Goodale, Bill C-71 is a response to substantial increases in firearm-related offences since 2013. It is claimed to be legislation driven and justified by the empirical evidence. Or so it would seem. In actuality, the statistical basis for Bill C-71 is very weak. It relies on faulty assumptions regarding crime and firearms and breaks with the government’s promise of legislation tempered by “evidence-based decision making”. Minister Goodale’s assertion that “gun homicides are up by two-thirds since 2013” should concern Canadians. After all, that’s quite an increase. But why select 2013 as the baseline for comparison? Because 2013 was a year of historical lows, a statistical outlier of sorts. According to Statistics Canada, 2013 had the lowest police-recorded crime rate since 1969. In fact, it had the lowest rate of criminal homicides in 50 years (1.45 per 100,000) as well as the lowest rate of fatal shootings ever recorded by Statistics Canada (0.38 per 100,000). By selecting a year of record lows, marginal increases in succeeding years look like significant surges. This explains Minister Goodale’s decision to use just these four years (2013 to 2016) of crime data instead of the standard five. Selecting 2012 as the point of comparison would considerably weaken the perception that gun violence had increased precipitously. Gun homicides have not exploded. They have regressed to normal levels prior to 2013. 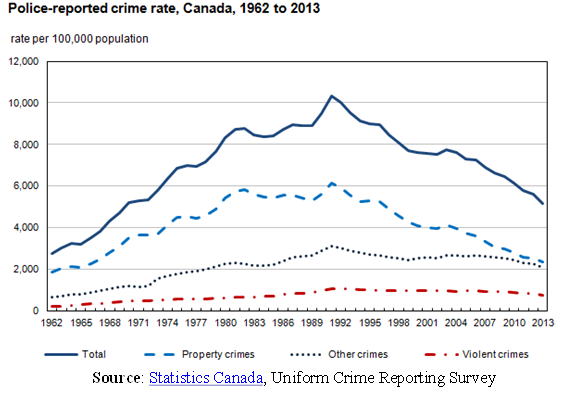 In fact, Canada’s crime rate has steadily declined since the 1990’s. What’s more, Bill C-71 misunderstands the nature and frequency of violent crime. Most crimes in Canada are neither violent nor involve a firearm. In 2016, violent crime made up 20% of all Criminal Code offences. In fact, 78% of violent crimes did not involve a weapon. When a weapon is used, either a knife or a blunt instrument is preferred. “Other weapons” account for 19% of weapons-related offences. Only 3% of violent crimes involved a firearm in 2016. This rate oscillated between 1.9% and 2.3% between 2009 and 2014. Since 1995, knife-related and firearm-related homicides have kept apace, repeatedly trading places as the most common homicide method in Canada. If we are adopting a public safety measure based on lives lost, why hasn’t Bill C-71 targeted knives? After all, of the four years used in Minister Goodale’s assessment, three (2013, 2014, and 2015) had more knife homicides than gun homicides. 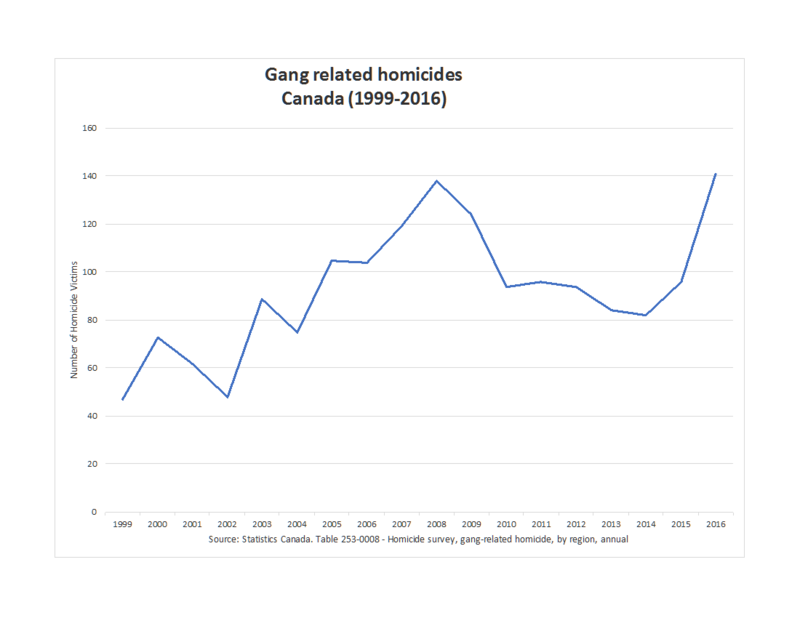 Nevertheless, Bill C-71 fails to address the area where gun violence has actually risen over the past 20 years: gangs. Gang violence has steadily risen since the 1990’s, increasing from under 10% of all homicides in 1999 to 24 % in 2016. Importantly, the 20% increase in homicides between 2013 and 2016 was driven by an astonishing 68% increase in gang-related homicides over that period. In 2016, 54% of all firearm-related homicides were gang-related. However, this rise in gang violence is concentrated in several urban hubs. From 2013 to 2016, gang-related homicides doubled in metropolitan areas. In Regina alone, the rate of firearm-related violence is up 113% (26 per 100,000 in 2013 to 59 per 100,000 in 2016). Though rates of firearm violence in urban and rural areas are comparable, a large proportion of violent crime occurs in First Nations Reserves, which predominate in rural Canada. In fact, Minister Goodale suggested that new drug markets were driving gangs into indigenous communities. Crucially, Bill C-17’s focus on the legal means of firearm ownership disregards illegal channels. The firearms used by gangs are generally smuggled into Canada as part of the drug trade. Analyses of guns recovered from criminal activity in various Canadian cities show that over two-thirds had been smuggled. This is not to suggest that illegal firearms cannot be acquired domestically. However, the claim that there has been an increase in straw purchasing where gang-affiliated people with clean criminal records get firearm licences to traffic guns is not supported by any statistics. In general, the claim that there has been an increase in illegal firearms obtained from “domestic sources” is not backed by Statistics Canada. However, there is a large pool of firearms in Canada with questionable legality. When firearm licensing was introduced in 2001, between one-third and one-half of then law-abiding Canadian gun owners declined to apply for a license. Though civilian gun owners ranged from 3.3 million to 4.5 million in 2001, fewer than 2 million licenses were issued. 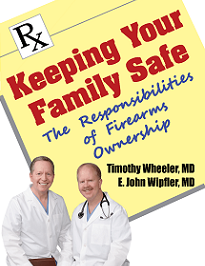 Many guns and gun owners remain outside the system. 3) Investing in Canada Border Services Agency to address the smuggling of drugs and firearms into Canada. In sum, a more measured approach is required. Measures like Bill C-71 which focus exclusively on law-abiding Canadians appear more as “red herrings” than effective crime-reduction strategies. 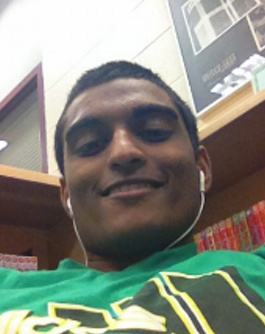 —Vincent Harinam is a law enforcement consultant and research associate at the Independence Institute. He is set to pursue his PhD in Criminology at the University of Cambridge. —Gary Mauser, PhD is professor emeritus in the Institute for Canadian Urban Research Studies and the Beedie School of Business, Simon Fraser University, British Columbia. 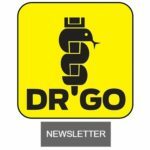 He specializes in criminology and economics, has published extensively on firearms legislation, firearms and violence, and has provided expert testimony on criminal justice issues to the Canadian government.